Forget about the things that are behind you, says the LORD. You do not need those things left behind. They mean nothing. I Am your everything and your all in all! Nothing that was, is, and I AM! I Am your healer! I Am your Provider. I Am your source! I Am your life! I Am your provider, helper! You need nothing else. I AM! Trust that you do not need anything or anyone but ME, for I Am your sufficiency in All THINGS, not just some. I Am your shield, and exceeding, GREAT REWARD! Says the LORD. I Am not broke, says the LORD. I have need of NOTHING, because everything belongs to ME. I created everything for MY purpose and pleasure and glory. The enemy may be gloating, feasting and drinking and bragging about the things that he stole from ME. For did you not know that the earth and the fullness thereof, belongs to ME? What He stole from you, he stole from ME! I will repay, as I invade his victory party and spoil the spoiler. But I will restore you and heal you and lavish you with My goodness and mercy and enrich you with an abundance you never dreamed of, so that you will be equipped to fulfill every work that I have called and chosen you to do for My kingdom, says the LORD. Praise God! Restoration is at hand! Amen! THANK YOU MY FATHER GOD FOR BEING A MERCIFUL FATHER OF RESTORATION, NOT ONLY FOR ME, FOR MY LOVED ONES ALSO, SO SHALL IT BE UNTO US, IN JESUS NAME, AMEN AND AMEN! Yes lord thank you for restoring my life. Oh Lord, You are my great and exceeding reward, thank You that You are the Banner over me, I glorify You!! Thank You, Lord Jesus, for Your infinite GRACE and continuing LOVE and CARE, even when we continue to sin; Your LOVE is NEVER-ENDING!!! Hallelujah and Amen!!! AMEN. Thank you for this encouraging message. 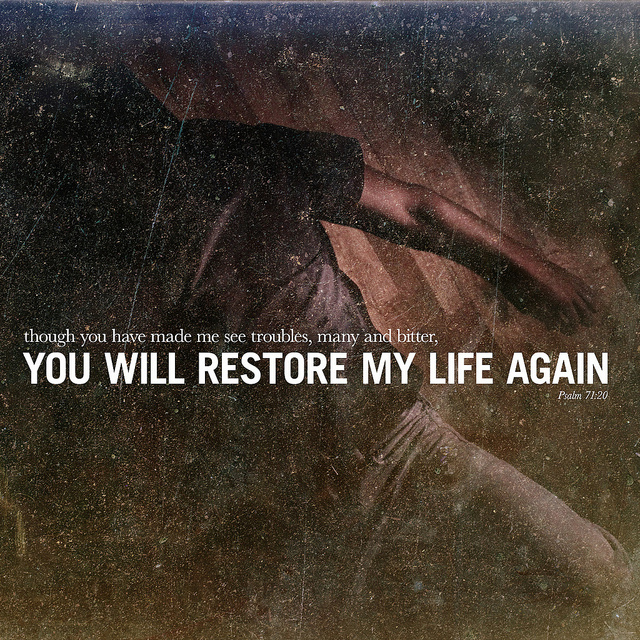 Lord Jesus Please Restore My Life Again. Lord I Pray.Amen.